Sunday, October 15 2017, 6:00 pm. Vocalist Dominique Eade, with Harvey Diamond, piano; Jon Dreyer, bass; Joe Hunt, drums. At the New School of Music, 25 Lowell St, Cambridge MA. Walk from Harvard Square, take the #71 or #73 bus, or park free in the lot behind the school. Vocalist Dominique Eade has been an active performer on the vibrant Boston and New York jazz scenes since the 80's. Early in her career she performed with Mick Goodrick, Donald Brown and Bill Pierce. In addition to her own groups, Eade also has performed contemporary classical music and was a featured soloist with Boston Musica Viva, Composers in Red Sneakers, NuClassix and jazz big bands Orange Then Blue and the Either/Orchestra. Eade released her first CD, The Ruby and the Pearl , featuring Alan Dawson and Stanley Cowell, for Accurate Records in 1990. She performed in a variety of contexts including soloist roles in two Anthony Braxton operas, duo performances with Gene Bertoncini, an adventurous trio with Ben Street and Kenny Wollesen performing weekly in the East Village, and duos with Mark Helias and Peter Leitch. She played at The Village Gate, The Five Spot, Birdland, Visiones, and Cornelia Street Café with groups including Larry Goldings, John Medeski, Fred Hersch, Kevin Hays, James Genus, Gregory Hutchinson, and Tom Rainey. She recorded her second CD, My Resistance is Low (Accurate), featuring frequent collaborator Bruce Barth, George Mraz, and Lewis Nash. She recorded two critically acclaimed CDs for RCA Victor, When the Wind Was Cool featuring Benny Golson, Fred Hersch, James Genus, Matt Wilson, and many others, and The Long Way Home with Dave Holland and Victor Lewis, which highlighted Eade's arranging and songwriting. Eade and pianist Jed Wilson released a CD of duets, Open , in 2006. In the last decade she has reemerged in New York, first with Ran Blake, then in duos and quartets with Jed Wilson, Ben Street, Matt Wilson, and in duo with guitarist Brad Shepik, all receiving critical recognition. She has been on the faculty of New England Conservatory since 1984 and also teaches privately in New York. Her students have included Luciana Souza, Kate McGarry, Sara Lazarus, Lisa Thorson, Julie Hardy, Patrice Williamson, Kris Adams, David Devoe, Aoife O'Donovan, Roberta Gambarini, and many others. She has also traveled in the United States and Europe as a clinician and performer. The legendary jazz pianist Harvey Diamond has graced the Boston area for decades with his music which is at once both deeply technical and deeply emotional to even the most casual listener. 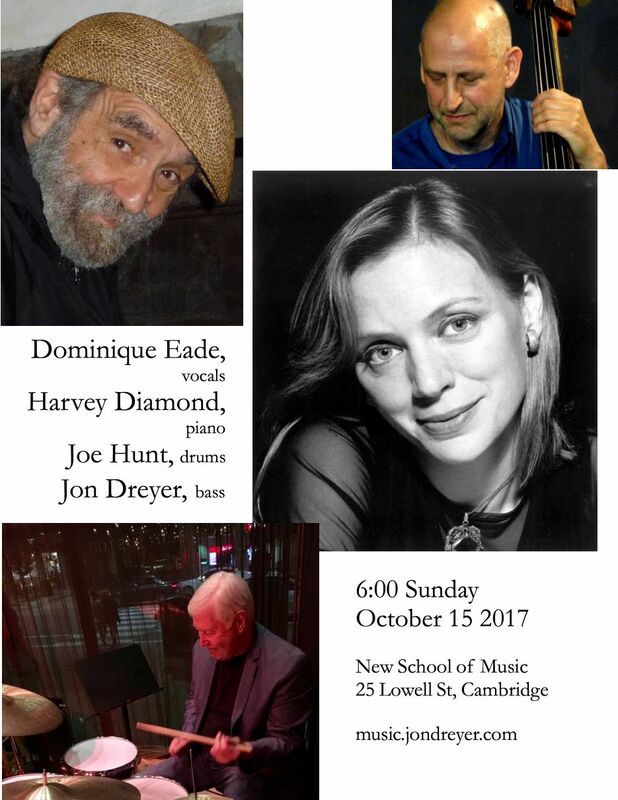 Critic Steve Elman of The Arts Fuse says that pianist Harvey Diamond … is almost as revered among Boston musicians as the Dalai Lama is in Tibet. He has done concert appearances with NEA Jazz Masters Sheila Jordan, Dave Liebman, and Art Farmer, and also with Charles Neville, Harvie S, Jay Clayton, Joe Hunt, Jason Palmer, Cameron Brown Marcus McLaurine, and many others. After decades of patience by his fans, he has finally released his first CD as a leader, The Harvey Diamond Trio . He is also a revered teacher. Bassist Jon Dreyer is one of Harvey Diamond's closest collaborators. He also performs regularly with James Merenda, both as a member of his band TickleJuice and also in more mainstream jazz settings, and has performed with most of the Boston jazz community, including Jason Palmer, Phil Grenadier, Adam Janjigian, Yoko Miwa, Frank Wilkins, Joe Hunt, and Steve Langone.